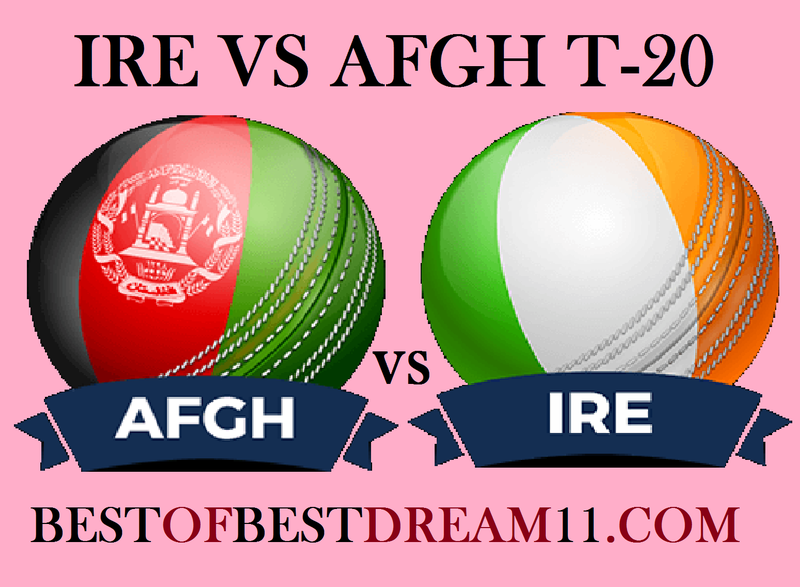 Here is best "AFGHANISTAN VS IRELAND" 2ND T20 match, Dream11 Predictions for the Fantasy user ,who venue are looking to make a strong team for maximum win. We are providing latest news, match update, information about the match .The team is picked by using various factors on the basis of performance, ground stats and latest form. In the three -match T-20 series , Afghanistan's team won the first match by 16 run, lead 1-0 in the series. I n rain affected match ,Afghanistan scored 160/7(18over)in the first match. in reply, Ireland's entire team was able to score only 144 runs.This match will be very important for both teams.if Ireland lose the match ,then the series will also be lost. For AFGH , Hazratullah Zazai, who played his maiden match,batted brilliantly in the last match . He played a magnificent innings f 74 runs in 33 balls. Mohammad Shahzad(29 runs) and Asghar Stanikzai(31runs) also gave a big score to their team by playing a good innings. in bowling ,Rashid Khan's good performance continues in this series too.In the last match ,he took 3 wickets. Mujeeb Ur Rahman (2wkt) and Aftab Aalam (2wt) had bowled well in the last match. For IRE , Paul Stirling(27 runs) and Gary Wilson(34runs) had batted well in the last match. Simi Singh (20 runs & 1 wkt) and George Docrail(22runs) also performed all rounder performance in the last match. in bowling, Tyrone Kane (2wkt) and Joshua Little(2wkt) bowled well and took wickets. Afghanistan's team will not temper with their winning combination,if there is no injury. After losing the first match,there may be some changes in the Ireland's team .